Friday, August 24, 2018 – Dominican Republic: Ocean Dredging DS signed its first long-term suction dredging contract with Empressa Generadora de Electricidad Itabo in the Dominican Republic. 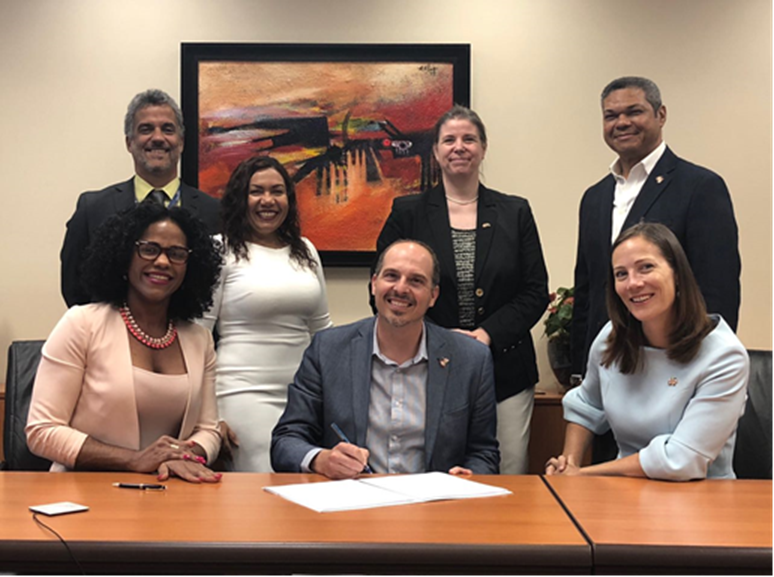 This multiyear agreement signed in the presence of the Canadian Ambassador in the Dominican Republic Shauna Hemingway supports Ocean’s development plan and its latest steps in the Caribbean. “The Government of Canada is committed to advocating responsible business practices that promote inclusive economic benefits for both the host country and Canada. As such, it expects and encourages all Canadian companies, of any size and in all sectors, to respect all applicable laws, to meet or even exceed international standards, to operate transparently and to conduct their activities in a socially and environmentally sustainable manner “said Shauna Hemingway, Ambassador of Canada in the Dominican Republic. The maintenance work to be carried out annually with the crews of the OCEAN TRAVERSE NORD dredge will facilitate access to the port and ensure safety of the vessels. This will help support and sustain the economic growth of the country, being the ports a key element for the international commerce. “In recent years, we have continued to increase our presence in the Caribbean through our service offering and the renewed confidence of our customers. The signing of this agreement with the Itabo Company, with which we have been doing business for several years, reinforces this approach. At Ocean, we build our relationships in order to be a trusted partner for all our customers, “said François Lessard, General Manager, Marine Works and Dredging. Ocean’s local partner in the Dominican Republic is E&M International Consulting. Ocean, a major Quebec maritime company, operates primarily in Quebec, Ontario, New Brunswick, Alberta and in the Caribbean region. Around 900 employees carry out a multitude of projects in the three major complementary sectors offered by Ocean, namely shipbuilding and repair, harbour towing and transportation, as well as rental of specialized marine equipment and dredging.